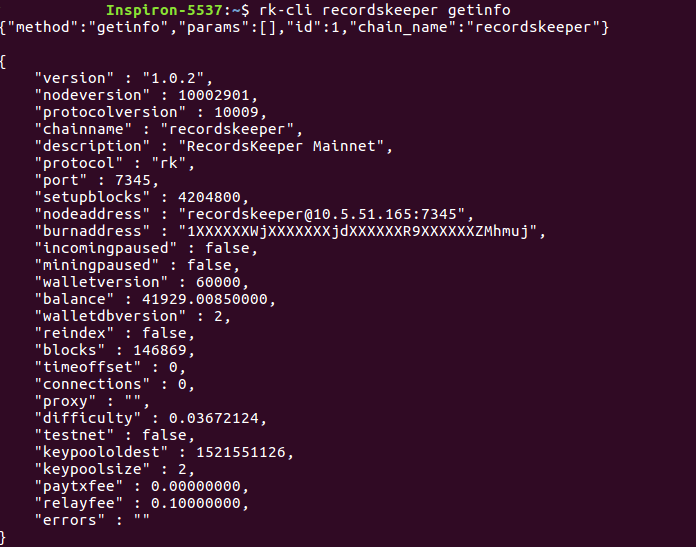 Moving the RecordsKeeper files to the bin directory to make them easily accessible from the command line anywhere. The RecordsKeeper Testnet blockchain is available for users to develop and deploy applications on. XRK Testnet tokens do not hold any value and are only available for testing. You can earn XRK tokens from RecordsKeeper Mainnet mining. Linux users can now go to the mining-permissions section. Only after the RecordsKeeper team grant mining permissions to your node address will you be able to mine XRK tokens into your default address. Once the permissions for the RecordsKeeper Mainnet have been granted, you can directly connect to the RecordsKeeper chain and see your mining progress. You can run the following commands to connect to the RecordsKeeper blockchain and view the mining address. You can run getinfo command or getaddressbalances command to see the balance in your node or directly the node address.